Everyone at least once in the life has visited the zoo. The feelings are various. Some people were amazed by unusual wild animals; others were worried because these beasts would never live in their inbred areas again. Who is right? Here are several pluses and minuses of holding creatures in zoo parks, which may assist to write an argumentative essay on this topic as well. It is well-known that many species have disappeared because of human activity. People destroy forests, kill animals for their fur and horns or just hunt for fun. This is cruel, but true. The only way mankind can help species which cannot survive on their own anymore is creating special parks, where these animals can live in safety, get food, water, and housing. What’s more, several kinds may breed in captivity. In such case, the certain population will grow and one time will be able to live in the nature area. Zoo parks give a possibility for everyone to see animals from book pictures alive. It is especially important for the kids as they have to discover the world including wild nature and creatures. Zoo parks keep people aware of how many individuals of certain breed left, what they eat and where they live. It may be an amazing practice for everyone who loves nature and wants to be closer to it. However, there are several minuses of zoos as well. There are the most significant. Very often, we find reports that animals in zoos meet with violence and brutality. They don’t have enough food, their life circumstances are terrible and cages are small and dirty. Moreover, volunteers usually take away from zoo parks creatures with injuries and illnesses which weren’t treated by the local stuff. Owners of such establishment, as a rule, save money on beasts’ nutrition and veterinary service. As a result, creatures die young and leave a purulent corpse. Animals with no liberty have different behavior as their kin in the wilderness. They don’t need to fight for the food, search the safe place and so on. Moreover, in cages creatures rarely have posterity. 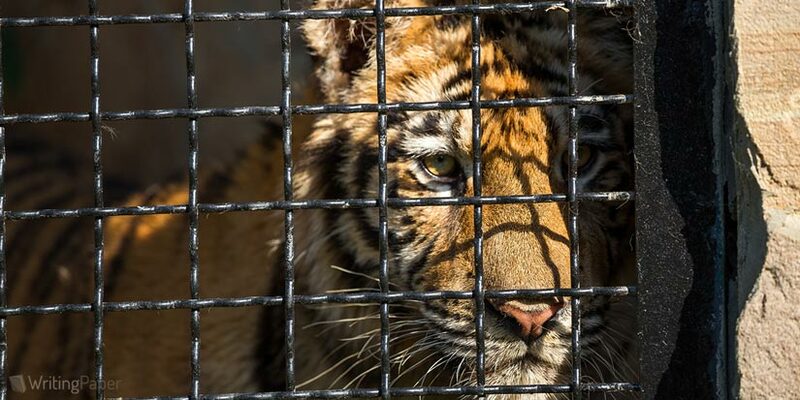 While watching at, for instance, caged tigers, kids don’t realize how powerful and fast they may be. Consequently, people’s notion about wild one one is blurred and wrong. Being in cages or aviaries animals usually suffer from loneliness and boredom. They cannot communicate with their relatives or enjoy hunting. What’s more zoo stuff often doesn’t care about their well-being, people only work for salary and don’t pay attention to beast’s needs. Thereto, many visitors come not to see undomesticated animals and their inborn behavior, but to touch, feed or annoy them. It is a common situation in the zoo to see when a group of people is screaming, putting hands into the cage and trying to catch animal’s attention. Sure, it provokes and irritates wild one, and his reaction may be unpredictable. To sum up, keeping beasts in cages is a controversial issue. In certain events, it is good for them; however, as a rule, they don’t have enough communication and care. Rated 4.5 | 269 votes.